A lovely signed copy of Peter Taylor’s first novel, a Proustian reflection on life and family in St. Louis, Missouri during the 1920’s. In turns tragic and humorous, it is a novel that reveals its depth and craft slowly to the reader, as Quintus Dudley, our protagonist, must helplessly watch his stepmother tiptoe on the brink of insanity. 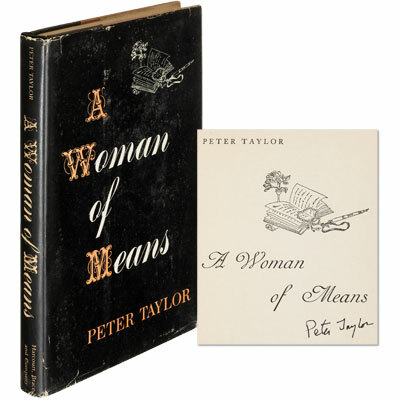 ‘No description of mere mortals or events can indicate the particular kind of excitement it possesses... the excitement of being constantly on the verge of deep perceptions and deep interpretations.’ ―Robert Penn Warren, The New York Times	‘In A Woman of Means, as in virtually everything else Taylor has written, the reader is transported into a place so faithfully similar to the real world, yet so imbued with a knowledge of it that none of us can hope to possess, that one is left breathless with admiration.’ ― Jonathan Yardley, The Washington Post.